Given the continuing strong and deep demand for rental housing in the wake of the single-family sector's burst bubble, it comes as no great surprise that savvy real estate entrepreneurs are scouring neighborhood nooks and crannies for opportunities to quickly and creatively produce apartments. And predictably many are uncovering solid prospects in other relics of the real estate bust: obsolete or otherwise under-performing small-cap commercial and special-purpose structures. Indeed with apartment rents (and in turn values) on a steady up-tick even as commercial rates languish, strategically located old factories, office buildings, churches, schools and the like are living anew as attractive residences. Of course a major factor determining whether or not such a venture pencils out is the cost and terms of debt available to buy the real estate (if necessary), design and engineer the envisioned residential conversion, and fund the corresponding materials and labor. And at least in the apartment sector, wannabe converters with solid experience behind them and a reasonable stash of cash on hand can secure pretty darned attractive pricing and proceeds these days. While some of the more patient developers might look to lenders licensed for HUD's low-rate, non-recourse (and assumable) FHA 221(d)(4) construction/permanent mortgage insurance program, your local or regional bank in most cases will be the logical source to tap for acquisition (again, if necessary) and development funding, says Larry Stephenson, senior executive vice president with NorthMarq Capital. A very short roster of life companies might consider small-balance, fixed-rate construction/perm transactions with exceptionally high-quality conversion projects and sponsorships in favored markets. And certain bridge-type lenders will offer short-term floating-rate financing for converting small-cap mixed-use projects where some of the existing space continues to generate rental revenue, Stephenson adds. But for most small-cap conversion ventures, Main Street bankers will be the best fit and can offer today's historically low debt pricing and likely as much as 80 percent of the needed funds. Depending of course on the sponsorship's experience and creditworthiness, and the project's prospects within the micro marketplace, banks are tending to quote apartment construction rates floating in the low-to-mid-200s (basis points) over today's minuscule Libor rates. Of course the borrower will need to pledge some personal assets beyond the real estate collateral to guarantee full repayment - but that's going to be well worth the commitment to get 80 percent loan-to-cost funding at a sub-3 rate. For example prominent Old Town Wichita architect, planner and developer Dave Burk and his partners tapped their relationship with locally based Fidelity Bank to convert the century-old, six-story East Douglas Avenue building once housing the Player Piano Co., into 36 one- and two-bedroom apartments ranging from about 700 to 1,200 square feet. The group appears to be doing pretty well with the venture carrying a cost of about $4.2 million (Burk, who lives in a nearby converted warehouse, purchased the structure a couple years back). About a third of the units were pre-leased at $550 to $1,300 when the project opened a few weeks ago. The developers also restored and otherwise fixed up the 33,000-square-foot "heavy timber" structure's exterior utilizing nearly $400,000 from a city special-assessment facade-improvement program - with low-rate bonded debt ultimately paid off from the rental cash flow. Burk didn't respond to MarketBeat's inquiries regarding the rates and terms Fidelity quoted. As a trio of other new projects suggest, conversion activity tends to be most prominent in long-established communities where older buildings with sturdy bones are ready for gutting. Their respective developers - who likewise didn't respond to our inquiries - also illustrate that novices generally need not apply for such fundings. 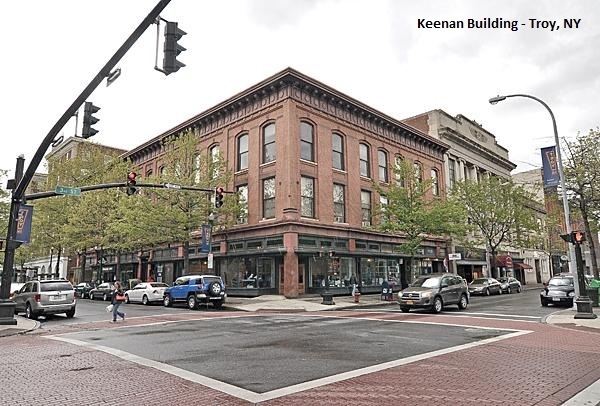 *Veteran Upstate New York developer Sonny Bonacio and associates at Bonacio Construction in Saratoga Springs are converting the upper two office floors of the late-19th Century Keenan building at Third and Broadway in downtown Troy into 14 one-and two-bedroom apartments ranging from 663 to 1,346 square feet. While retaining the street level as retail space, Bonacio expects to invest about $2 million into apartments slated to rent for roughly $800 to nearly $1,800 at the property he purchased from Pioneer Bank last spring for $595,000. *After transforming Gate of Heaven Catholic Church's old rectory into condos a few years ago, "Southie" Boston conversion specialist and restaurateur Jon Cronin is now endeavoring to convert the original 1863-vintage church structure (used as the parish hall for the past half-century) into 24 apartments. He's preserving the four-story East Fourth Street structure's masonry exterior while adding some dormers, as he's creating two-level units on top of two lower floors of flats at an estimated cost of about $7 million. *Long-established residential specialist MACK Companies in Tinley Park, Ill. is leasing up the 21 two-bedroom units it created atop ground-floor commercial spaces at a four-story former shoe factory building on South Central Avenue in the near-in Chicago suburb of Cicero. The firm bought the property last spring for $1.2 million from Old National Bancorp - which had taken it back after a previous would-be developer's plan to convert the structure into for-sale condos fell apart amid the real estate bust. And again, some would-be converters willing to navigate HUD's occasionally frustrating processing and approvals bureaucracy can look forward to 90 percent leverage - and 40-year fixed-rate construction/permanent financing likely in the high-2s - if they find an FHA lender willing to fund a small-balance 221(d)(4) transaction. A real-world example here: Milwaukee developers Kyle Strigenz and Tyler Hawley opted for a (d)(4) loan to fund conversion of the three-story, 1915-vintage structure that served as home to the Junior House (renamed JH Collectibles) clothing factory and warehouse. The partners bought the 65,000-square-foot building in Milwaukee's Fifth Ward district about a year ago for $1.1 million, and recently worked with Love Funding to secure a $7 million HUD-guaranteed loan to transform the property into 50 apartments.